South Korean casino equipment maker Hydako Co Ltd displayed its popular “Money Blessing” video slot machine game (pictured left) at the recent Global Gaming Expo (G2E) Asia casino trade show and conference in Macau. 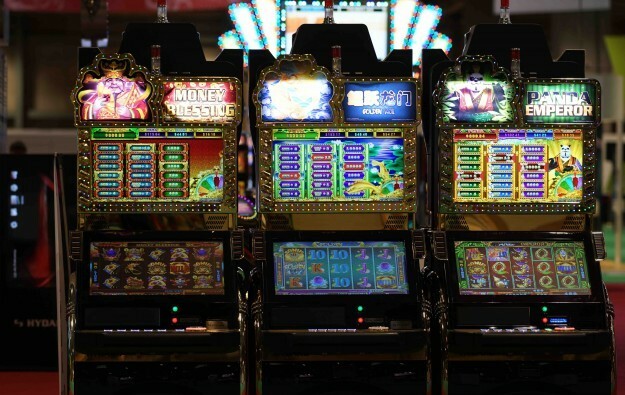 The company also exhibited an upgraded version of the product, called “Money Blessing Deluxe”, which is designed for the company’s new slot cabinet LNK 230D. The latter has dual-screen capability and a 23-inch monitor offering full high-definition video and upgraded sound compared to the company’s 22-inch LNK01 cabinet. “Innovations include the fact that the new platform has a higher capacity memory, and a dual full-screen 23-inch monitor, and two more speakers than the previous LNK01 model, so it offers a more immersive experience for the player,” Jeff Heo, marketing manager for Hydako, told GGRAsia. Money Blessing is a five-reel game that can be set up for as few as nine lines or as many as 50 lines, and offers a four-level progressive jackpot. “It is our most popular product in Asia Pacific right now, especially in the Philippines and Macau,” stated Mr Heo. “We also have the Money Blessing game launched on [our] online social casino. Among the 30 or 40 machines [on the social platform] it is the number one game,” added the executive.